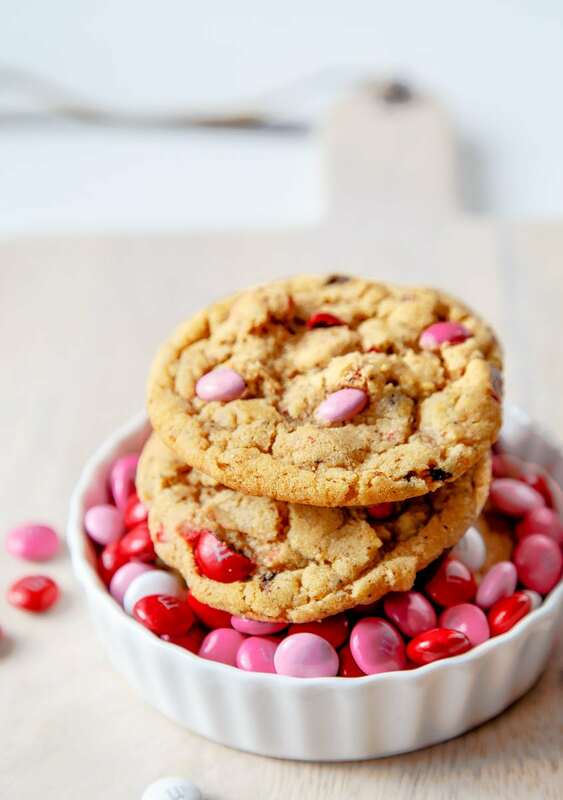 MM cookies: your favorite soft and chewy m&m cookies made with Valentine’s Day candies! Can I introduce you to a way to eat cookies and candy at the same time? Oh, so you’ve heard of adding M&Ms to cookies before? Hmm. Well, can I at least introduce you to chopping M&Ms into tiny pieces before adding them to your cookie dough? Yeah, now we’re talking about cramming even more candy into our candy cookies. I knew I could be of service to you today! (You’re welcome). Reward yourself with MM cookies! 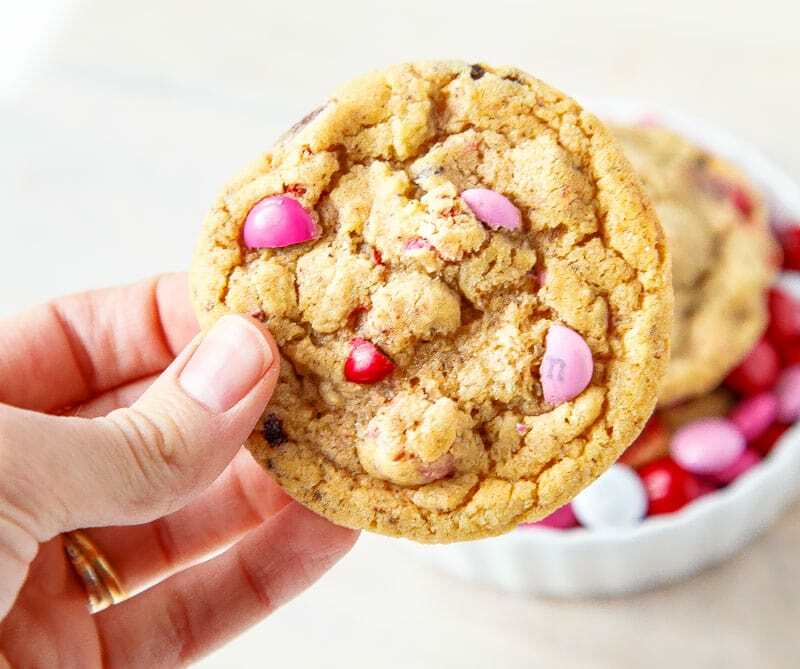 So, I grabbed a bag of pink and red Valentine’s Day M&Ms at Target (because I like pretty things), and then I added a mere 1/2 cup to my standard small batch of chocolate chip cookies recipe. And honestly? They tasted just okay–not amazing. It didn’t blow my mind, and they definitely weren’t good enough to share with you. Since my favorite way to enjoy M&Ms is in a blizzard, where they’re chopped into tiny pieces, I chopped the pretty little M&Ms to smithereens. Then, I stirred them into my cookie dough. Perfection. These M&M cookies are not only fantastic because a 1/2 cup of chopped M&Ms is more than a 1/2 cup of non-chopped M&Ms—they’re delicious because the espresso powder called for in my chocolate chip cookie recipe makes these cookies taste better than the bakery cookies. Yep, I said it. Try it for yourself. If I ever open a bakery, I will add espresso powder to all of my pastries, and it will be my signature flavor and no one will know why my desserts are so good! Except you. You will know. But, I like you so it’s okay. Since this recipe uses just the egg yolk, be sure to check out my ways to use a leftover egg white section! 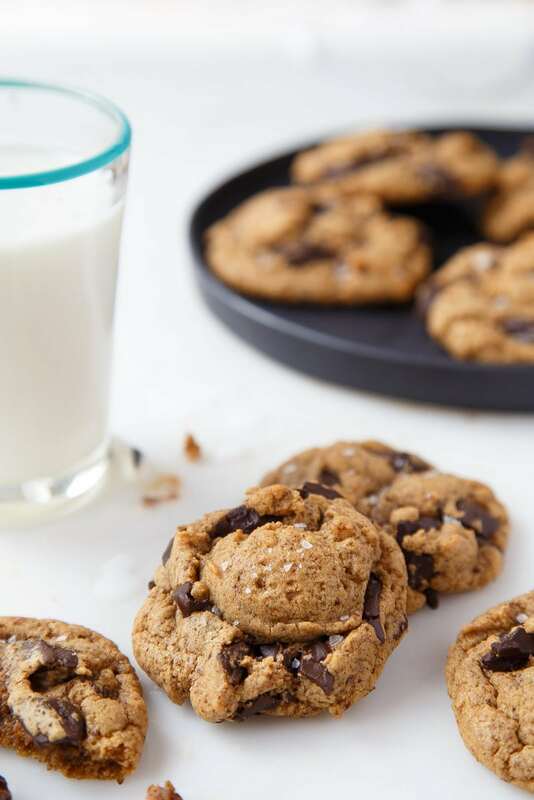 If you’re looking for more small-batch cookie recipes, try my recipe collection for 1 dozen cookies or less. Preheat the oven to 375Â° and line a cookie sheet with parchment or a silicone mat. In a medium bowl, cream the butter, brown sugar and granulated sugar together. Beat very well, about 45 seconds. Add the egg yolk and vanilla and beat until combined. In a small bowl, whisk together remaining ingredients (except M&Ms) and add it in 2 batches to the creamed butter, beating just to combine. Stir in the chopped M&Ms. Make 12 dough balls (roll them in your hand), space them evenly on the cookie sheet and bake for 9-10 minutes. Remove from oven, and let cool for 1 minute on the baking sheet before moving them to a wire rack to cool completely. Oh, these look so sweet! I did something similar with some leftover Christmas chocolates – so much better chopped up and stirred all the way through the batter. There’s really nothing better than a warm cookie! These are so beautiful, what a fabulous idea. I’m going to hunt down some Valentines M&Ms and make them this weekend! Thanks for the recipe!!! I love when M&Ms are finely chopped up in milkshakes, too. Yum! Also in love with red and pink M&Ms. These cookies are gorgeous! Your photos are stunning. Happy New Year!! 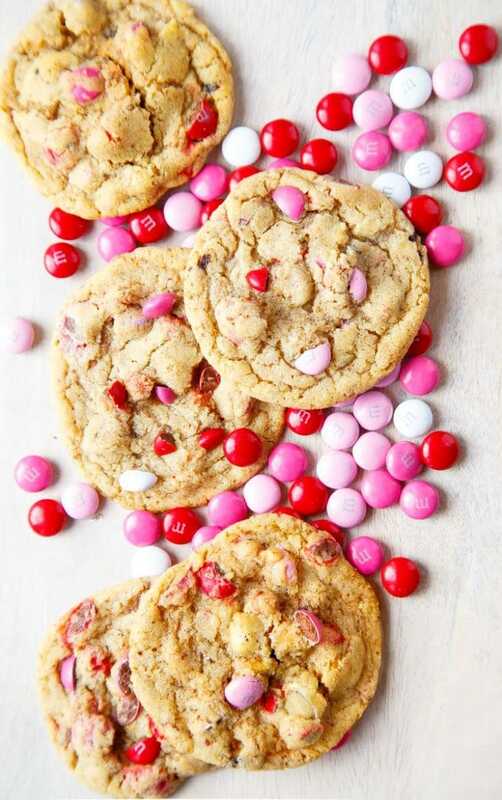 These would be great gifts for V-day, if I don’t eat them all first! I adore M&Ms in cookies! I’m a huge fan of M&Ms in cookies! These are so festive! I love MM cookies!! Chopping the candies up is kind of brilliant. I’m with ya on the espresso powder, I think it adds such depth to baked goods! These cookies look great! I have been smashing M&M’s and adding them to a basic choc chip cookie recipe for a few years now. I actually started doing it because It bugged me, for some reason, to see a friend’s children pick all the M&M’s out of my cookies and then disgard the actial cookie. I have strong feeling about teaching kids how to eat politely and appropriately as they learn and grow. I taught kindergarten for many years and good lord, some of the eating habits I observed were beyond appalling and totally inexcusable. That said, I decided to break up the M&M’s so that the temptation to pick anything out of the cookies was eliminated. Funny thing, the cookies seemed to take on a different level of flavor…more intense and delicious. My friend’s kids now gobble down the cookies everytime I bring a batch to them. I love the idea of this small batch and can’t wait to try it. I guess I have a good excuse to buy some M&M’s! 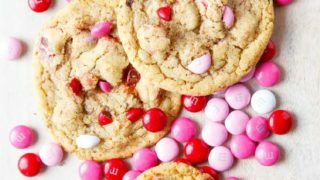 Um, yes to cookies all year, but especially when they are for V-Day!! Only you are smart enough to realize that chopping M&Ms is a good idea. Love it! Oh my gosh, chopping the M&Ms up? Brilliant! I love M&M cookies and these one look perfect! Great idea to chop the M&Ms up! I can’t wait to try this with the espresso powder: sounds like a really cool idea and a great way to feed an addiction for chocolate AND coffee at the same time, lol. I can’t wait to give this to the kiddos and tell them there’s coffee in it and see what they say because they always make fun of me liking coffee too much. BTW: I have to use ad blocker on your site now. The ads lately have just gotten really big and annoying – and the site seems a lot faster without them fyi. I totally want to support you but I never click on them anyways (at least not on purpose) so I figure no harm in blocking them but thought you might want to know. Hi Cristina, I love your blog and always have success with your recipes! These cookies taste great, but they came out very flat and crumbly when I made them today. I’m thinking that my butter, which I softened in the micro for @ 15 seconds, was the issue. How do you soften butter for the best results? Also, would chilling the dough help to create a puffier cookie? Thanks so much! Was the butter completely melted, or just softened? That would make a huge difference. Butter is beaten with sugar to create air pockets in the fat to make a fluffy cookie. 2 people, 6 cookies, 24 hours? That’s not even close to judgement, that’s just regular delicious cookie math. My secret is cinnamon….it’s in everything I bake. And some encouraging words…maybe I whisper “be good cookies, bake up and be yummy” every time I put something in the oven. Moving soon and am not buying anything that won’t be gone in 3 weeks, but espresso powder is on the “new house” list because I feel like I’ve been needing it for so much lately. I love your secrets, Allison :) <3 Good luck on the move! The cutest cookies! And of course I love making a small batch. Yum. Great idea to chop up the M&Ms. 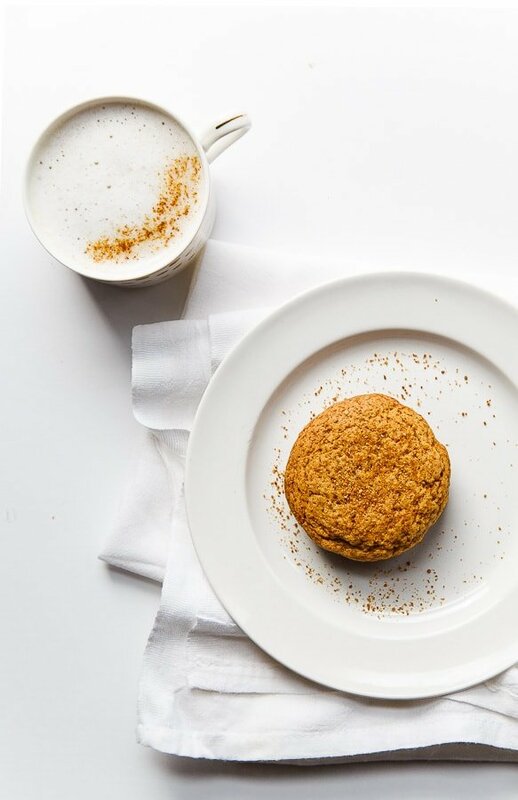 I’ve had them in an oatmeal cookie too and it is delish. Just took a batch of these out of the oven and they turned out perfectly! It’s the perfect sized batch for my husband and I. Thank you! Love your blog! I just got a mini kitchen aid and picked up a bag of neopolitan m&ms. I am making THESE right now!! So so excited! yay! I hope you love them, Noelle! I don’t have any espresso powder and don’t really want to go to the store, is there a sub I could use or would it be fine without it? A friend asked me to make these for when she comes over! Thank you! It’s fine to leave it out :) Enjoy! These look amazing! I want to make these with my daughter this wknd, I’m just wondering if the espresso powder if safe for kids?